Fri., Dec. 29, 2017, 4:54 p.m.
Donald S. Burke has little trouble finding a parallel with the opioid epidemic’s surging death rates and elusive solutions: the early years of AIDS. Burke led the U.S. Army’s research on HIV/AIDS before and after powerful new medications converted a fatal infection into a chronic disease. He remembers the waves of sickness, barriers of stigma and frustration of being a doctor with no idea what to do. That, he believes, is roughly where the U.S. is now in the fight against addiction. Just in December, in fact, newly released federal data showed more than 63,000 drug-related deaths in 2016 – up 21 percent from the year before and the biggest one-year rise in three decades. With substance abuse already a major issue from Philadelphia to the White House this year, the Inquirer interviewed experts in five areas of addiction. Each was asked the same basic questions: Where are we in this crisis? What’s coming next? What has to change? Andrew Kolodny wants to correct the “popular media narrative” that a prescription opioid problem turned into a heroin problem, which turned into a fentanyl problem – and that efforts to check the first worsened the others. The smallest is made up of longtime addicts, largely blacks and Latinos in their 50s through 70s. They started on heroin in the 1970s and ’80s, and watched their buddies die off. Fentanyl is killing the survivors. The middle group, almost entirely white and largely rural and suburban, is in their 20s to 40s. They get the lion’s share of news coverage: young men and women dying in public with needles in their arms. Coroners must investigate their deaths. Many began on prescription painkillers – used recreationally or prescribed by doctors, typically briefly – as far back as the mid-1990s, when Purdue launched OxyContin with extensive marketing to physicians. They managed their addiction by buying costly pills on the street. As their cravings worsened and cheaper heroin became available, they switched. “That switching isn’t new,” Kolodny said. But when dealers began lowering prices by mixing in cheap fentanyl around 2011, switching was more likely to mean dying. The largest group, in their mid-40s through 80s, is largely invisible and their deaths vastly undercounted. Their regular doctors have prescribed pain pills for years. They never move to heroin. And when they die, of heart disease or an infection, opioids as a contributing factor doesn’t come to mind. “No one wants grandma to have died of an overdose,” Kolodny said. The differences among the groups show that this is “an addiction epidemic, not a drug abuse problem,” he said. “We think that the number of overdoses is continuing to increase,” said Caroline Johnson. But there is “very preliminary” evidence of a “slight leveling off of fatalities,” she said, meaning that deaths this year might rise by just a third or a little more, a dulling of the sharp upward spike that began in late 2016. That achievement could be due, in part, to the priority the city put on supplying the opioid overdose reversal medication naloxone to community health centers, homeless shelters, rehabs and SEPTA police. 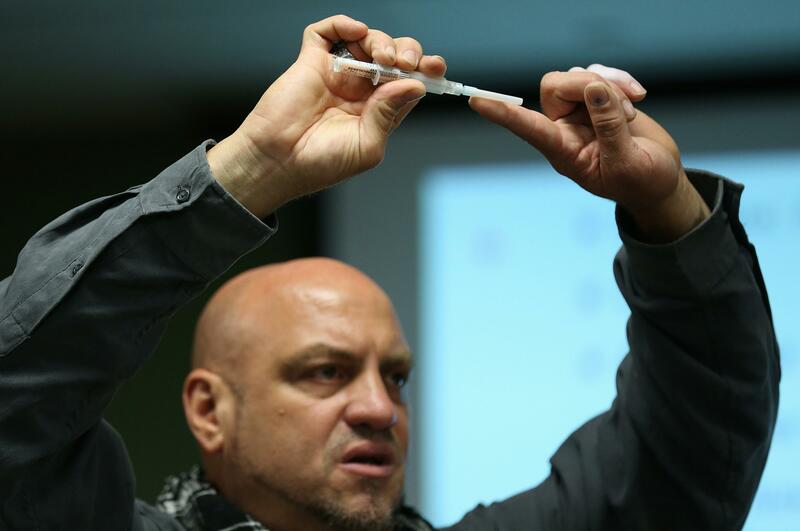 Several hundred residents whose loved ones are addicted have completed two-hour classes in how to administer Narcan, the nasal spray version. The Department of Behavioral Health plans more in the new year. Johnson co-chaired a subcommittee of Mayor Kenney’s opioids task force that recommended the city consider operating supervised injection sites. They would be “just another tool” in a limited kit, she said. Attitudes have changed dramatically since A. Thomas McLellan began his career at the Philadelphia VA Hospital counseling heroin-addicted soldiers returning from Vietnam. The public has gotten “much more sophisticated” about addiction, he said. Physical health and mental health are increasingly seen as the responsibility of the same medical system. He agrees with President Trump’s October declaration of a public health emergency, which provides help ranging from the lifting of budgetary constraints to speeding up contracting. It also empowers state secretaries of health to take similar actions. “None of that has happened. I’m not sure why. I don’t think it’s political. This is one of the very few issues where everyone agrees it’s important. I really don’t understand it,” McLellan said. Without action, he said, the recent “exponential” growth in drug deaths will likely continue. Gary Tuggle, who is retiring at the end of the month after 2 1/2 years overseeing DEA’s Philadelphia Division, does not see the busts as a good thing. “We have an insatiable appetite for drugs, both licit and illicit,” he said. The U.S., with 5 percent of the world’s population, consumes 80 percent of the pain medication. Unlike heroin, which must be grown and processed in lengthy cycles, fentanyl can be easily made using chemicals in a lab, ordered on the dark web and sent by mail. “Probably a thousand companies in China sell fentanyl,” Tuggle said, and seizures are increasing. A paper that epidemiologist Donald S. Burke co-authored last spring determined that drug fatalities doubled roughly every eight years between 1979 and 2015. The researchers were surprised. “Through this 37-year interval there have been major fluctuations in the drugs most commonly used, as well as changes in legal prescribing, illicit supply, substance use treatment, and law enforcement. Our observation that this continuous exponential growth pattern began well before the onset of the current opioid epidemic,” they wrote in a preliminary analysis, suggests deeper societal forces may be at work. The three approaches most commonly cited to prevent opioid overdoses – more naloxone, more medication-assisted treatment, and fewer prescriptions – “so far don’t seem to be making much difference,” Burke said. Modeling by his research team suggests that 150,000 to 200,000 people on pain pills transition to injection drugs every year. “The more people using heroin, the greater the probability that more people will use heroin,” Burke said, “just like the spread of an infectious disease.” If your friends are using, you are more likely to use. He wonders whether the kind of response used for epidemics like HIV might work: Determine key transition points, like when a painkiller addict is likely to try heroin, find those most at risk, and treat them. That might prevent more people “from moving down the addiction pipeline,” he said. Published: Dec. 29, 2017, 4:54 p.m.